With our global presence, it’s no surprise that our team of over 550 employees represents more than 50 different nationalities. We value diversity and inclusiveness, and aim to pioneer excellence and passion in everything we do for our customers. We are customer obsessed to say the least! Our passion towards our customers holds true for our own talented employees. At Travix, we encourage the development of our people. We inspire them to become high performers in the agile working environment where innovative ideas are always welcomed! Together we grow talent and together we move people. Please have a look at this video to get a feeling of what you can expect at Travix. Q: Are there development opportunities at Travix? We stimulate connectivity and information exchange between all departments through our various development programs. You will get the opportunity to develop yourself personally and professionally all throughout your Travix journey. 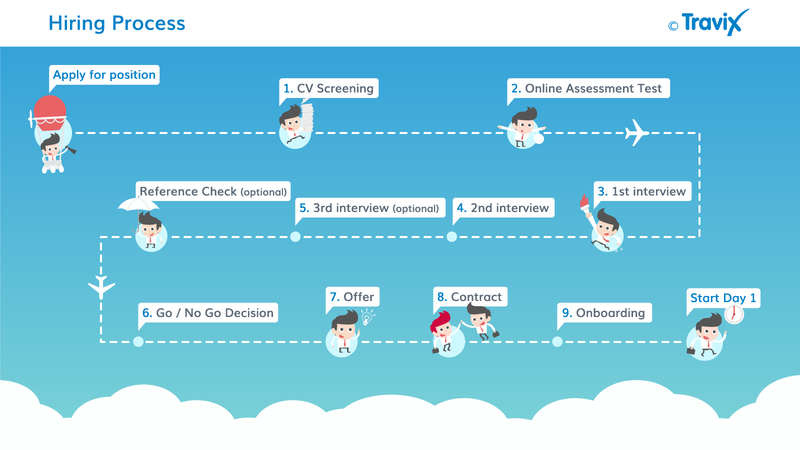 Q: What does the career progression look like for the position I am applying for? We have developed career paths for every position at Travix. Besides the opportunities to grow into a managerial or expert role, we also stimulate internal mobility through our I-Move Program and In Your Shoes Program. Q: Can you elaborate on the application process? Q: What advice would you give for me to put my best foot forward in applying for this position? Last but not the least, we are a fun loving organization and we really appreciate a good sense of humour! Q: Is Travix’ business model similar to the one of Skyscanner or Kayak? 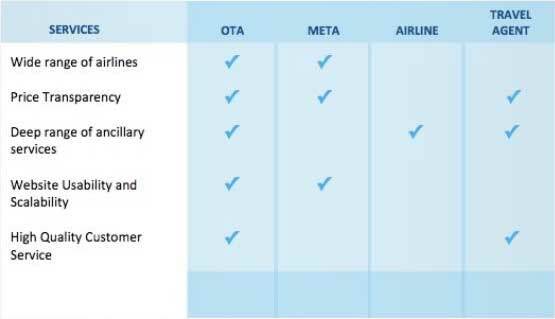 Travix is an Online Travel Agency (OTA) while Skyscanner and Kayak are Metasearch Engines (META). The visual below best describes the main differences between all players in the travel industry. Q: Why do you have 5 different brands within one company? Travix started out in 2011 as a result of the merger of three online travel companies: Beins Travel Ltd. (Cheaptickets.nl) AirTrade (Vliegwinkel, BudgetAir, Flugladen) and Vayama. Each company had flights at the core of their business and had well established brands in the countries they were active in. Travix took on a pragmatic approach and decided to heavily invest in its technology, global footprint and people. This resulted in a state-of-the-art open platform, a global presence in 39 countries and over 550 talented people with more than 50 different nationalities across the globe. 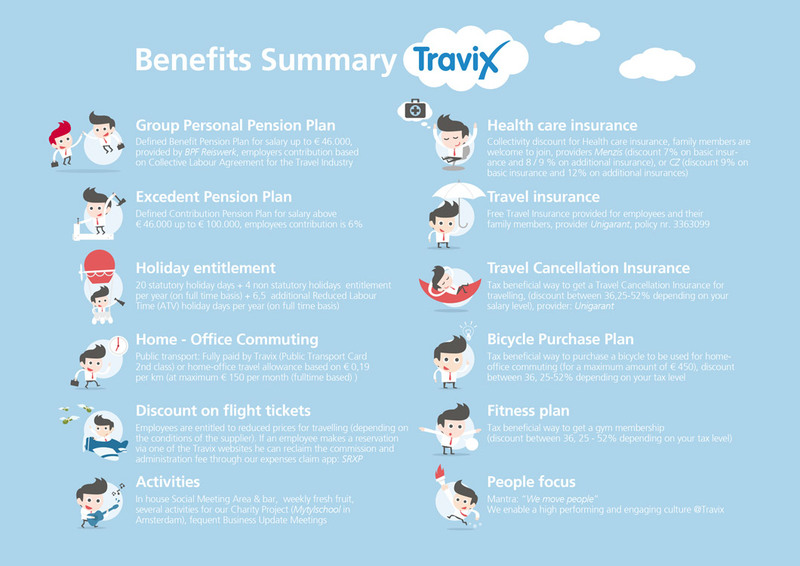 Q: What are some of the benefits of working at Travix?